Social Fund for Development (SFD) - Economic and social empowerment is believing in people’s potential when no one else would! Home » Newsroom » Field Stories » Economic and social empowerment is believing in people’s potential when no one else would! Leaving university with a business degree back in 2010, my dream was to wow the business world with my enthusiasm and be the number one businesswoman in Yemen. Little did I know, within a year of working in the business sector, that my passion is not to make rich people richer nor to gain the title “number one businesswoman”. My REAL passion in life is to be an influencer and a person who makes real positive impact in people’s lives. Realizing that, I started to become a dedicated and aggressively motivated person who fights for economic and social empowerment in Yemen. Right there, I shifted my career focus and objectives from making an empire of my own to making it possible for people with potential, but fewer opportunities in life, to build their idea of an empire. With the assistance of the SFD, the World Bank and the German development bank KFW, the first guarantee scheme in Yemen for SMEs was established in 2017. The LGP is bringing a little light to people’s lives day after day as it helps SMEs get access to opportunities they would normally not have. The LGP does not only provide beneficiaries with access to loans, it also provides them with technical assistance and advice on how to run their businesses, increase their revenues and decrease their overall expenses. Moreover, it embraces the beneficiaries’ interests and advises them on business opportunities within their markets, while guiding them through their decision making in loan and business management. The LGP believes in the potential underlining SMEs in Yemen. We provide them with “someone who believes in them” — support that they have typically not had up to now. Mariam is a 30-year-old female dreamer from Bagel, Al-Hudaidah. She was born into a poor family and had to leave school at the age of eight to help her injured father make a living. In addition to keeping her brothers in school by working on the farm, she used to make drawings at school and sell them to children who were more fortunate. Despite all the hardship and misfortune in her upbringing, Mariam used to secretly take small leftover raw materials from tailors around the area and stitch them together. This is how she started building the foundation of her empire. 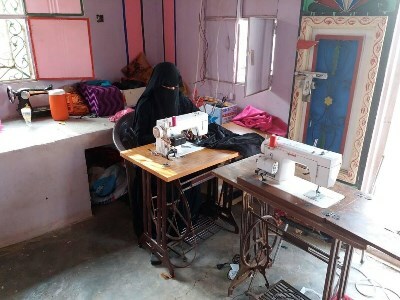 The stitching grew into sewing and with the income generated from it Mariam was able to purchase her first sewing machine — “the happiest day of my life…” — she recalls. Today, Mariam is a role model for younger women in her community. Whenever she can, Mariam visits schools to stitch and tailor school uniforms for the poor and the needy, free of charge as her own way to make a difference in the community she lives in! Arafat is a 33-year-old farmer from Hamadan, Sana’a. Like many other Yemeni farmers with a relatively large amount of land, Arafat and his family focused for many years on growing and harvesting qat on more than 75% of their fields. Unfortunately, the use of qat or khat, which is classified by the WHO as a drug of abuse that can produce psychological dependency, is not only a habit hindering the social and economic activities of the Yemeni population. It is also a major crop in the country, using up to 38% of the total water supply to the agricultural sector in Yemen. During the last winter, huge number of qat growing fields were destroyed leaving the qat plants dead or unusable. Arafat’s farm was not an exception. He was devastated to see his harvest destroyed. The LGP took the unfortunate circumstances Arafat and his family were facing to teach him and other farmers around the area that they could increase their revenue by roughly 28% by shifting their focus from qat to using greenhouses for growing high-value vegetables. As a result, Arafat took a loan facilitated and closely monitored by the LGP to buy and operate greenhouses. He has started growing tomatoes and cucumbers and actually reduced the portion of his fields in which he grows qat. Instead of leaving Arafat to struggle with his loses, LGP chose to see the potential Arafat had by helping him see the shortcomings of his former agricultural approach. While LGP expects Arafat to continue growing some qat in the future, at least by believing in him when no one else did we have allowed him to decrease the portion of his land that he allocates to qat growing and explore other options. “I never thought that I could get more profits from planting tomatoes than qat! … We were always told that qat is the most profitable!” — says Arafat during a field visit LGP conducted to his farm. Just because things are not easy, it does not mean they are impossible!